There is a group of European cities much smaller than the global giants which nevertheless have a reputation and kudos which belies their size. Some sectors of their economies are growing at phenomenal rates as they manage to attract global talent to their exceptional urban environments and cutting edge creative sectors. Companies looking for highly cost effective employee workspace and a high quality workforce are increasingly attracted to them. Berlin, Stockholm and Dublin all have well known and fast growing information and communication sectors which are often at the forefront of new technology and which are rivalling London and Paris when it comes to attracting the best tech talent. Meanwhile Milan, along with Stockholm, has a fast-growing finance and insurance sector servicing local industries including the world renowned fashion and design industries of the city. Important in this growth has been the quality of the urban environment and the quality of life that these cities offer. 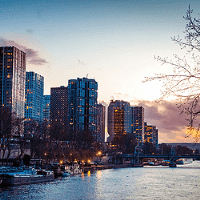 The Mercer Quality of Living rankings of 230 world cities measures a wide range of social, economic and environmental factors, including crime, pollution and congestion as well as culture health and housing to assess how easy life is for expat workers. Most of our European cities rank in the top quartile but the Urban Creators stand out above the larger cities. A young workforce is also a feature of the ‘Urban Creator’ cities. Both Dublin and Stockholm stand out for their demographic strength while Berlin and Milan buck the trend of the very much weaker underlying demographics of the countries in which they sit. 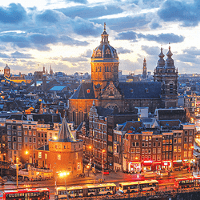 The faster-growing and younger populations of these cities are often there by virtue of the quality of education they offer as well as the nightlife, social advantages and other cultural attractions of the city. Milan stands out as the costliest among the Urban Accelerators, especially for workspace rents. Dublin is next largely due to the cost of residential rents which constitute over 90% of total accommodation costs. 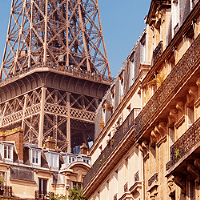 In this city, employers are most likely to feel accommodation cost pressures in the form of wage demands or housing allowances. 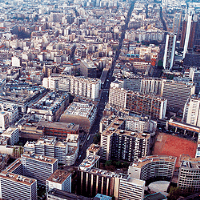 Low cost accommodation is a strong competitive factor among the urban accelerator cities. 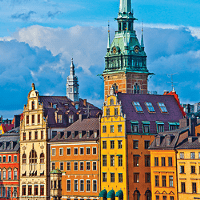 Stockholm has the highest ratio of workspace to residential costs after Berlin but its overall costs of accommodation are around the median for European cities overall. Its higher than average office rent levels are offset by cheaper property taxes and service charges. 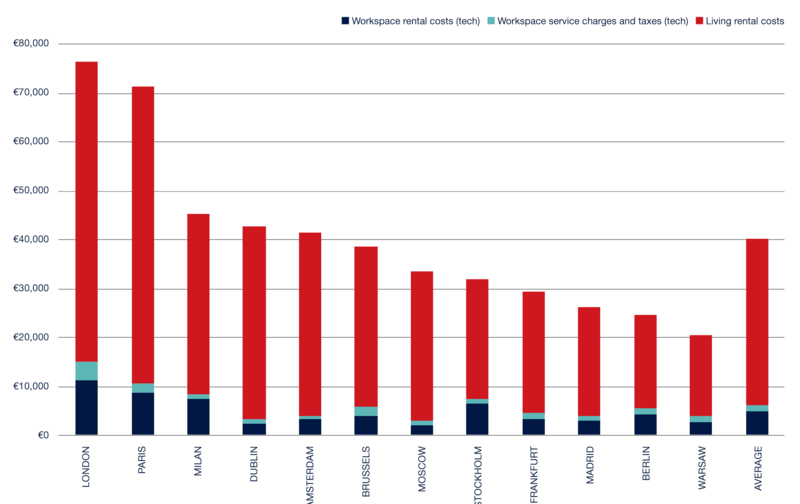 Berlin does not have the lowest office rent costs per worker but, thanks to its cheap housing, has the lowest accommodation cost per worker overall, narrowly beating Warsaw. Milan’s reputation is the design and fashion vortex of Europe, which means it has also grown a serious finance and business servicing sector alongside these glamorous industries. 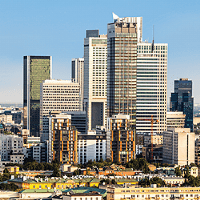 Nearly 100,000 of Milan’s 1.9 million jobs are in finance and business services. Host to Expo 2015, Milan is a top world centre of design and fashion. Four weeks a year are dedicated to shows and fashion events. The achingly hip Isola-Garibaldi district of Milan, on the north side of the city, is an island with a recent industrial past but is also characterised by a strong craft tradition and a history of commercial activity as well as widespread residential use. The neighbourhood forms the border between Milan’s downtown and the suburbs both physically and figuratively. It has a mixed-use “character” and the social backgrounds of its inhabitants are diverse. The area has been undergoing regeneration and a slow process of transformation since the 1950s but today it is the neighbourhood of choice for creative, designer, financial and tech occupiers. It is indeed one of the top city hotspots. 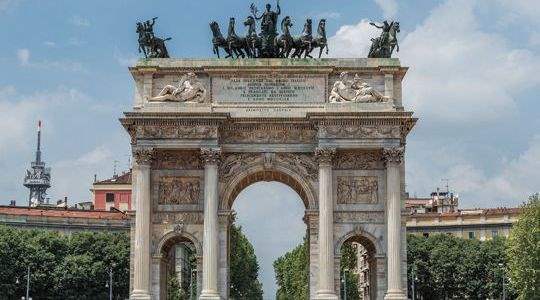 The area around the central train station is not usually the best one within cities but in recent years, Milan’s has been the object of diverse and wide regeneration. Developments have ranged from leisure to residential and co-working offices. The station is in the city centre and is the second biggest in Italy for both size and train traffic. Each day it caters for 323,000 people. 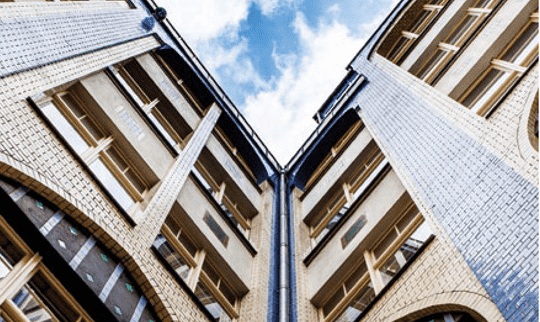 It is likely that both residential and offices in the area will improve significantly their appeal. Like most high profile world cities, the demand for living and working space in Berlin is for the urban central, not single-use, less dense outlying suburbs. The central districts of Berlin, which form its CBD and tech district are becoming very crowded as both residential and workspace occupiers have colonised once near derelict streets. 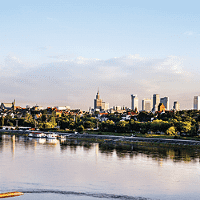 Office vacancy rates are at an all time low and residential vacancies are under 1%, making space difficult to find and pushing rents as high as €18 per square metre per month in the hottest district of Kreuzberg. Those seeking more space and cheaper rents are heading south toward Tempelhof. Those wanting large floorplates will be catered for by the large amounts of development land here but will have to wait some years for completion. Other alternatives are Tiergarten, where there is a strong development pipeline and the attraction of excellent transport links through the main train station, but even here, tenants will have to wait until 2020/21 for completion. 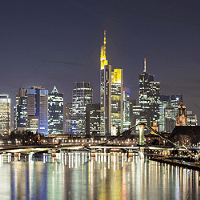 Smaller, footloose start-ups and scale-ups will find space in Mitte and Friedrichshain, but this will largely be in serviced offices and shared space rather than independent setups. 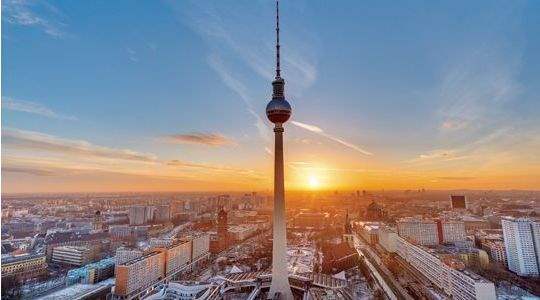 Any central or near-central urban space, residential or commercial, looks set to be in high demand in Berlin for the foreseeable future. 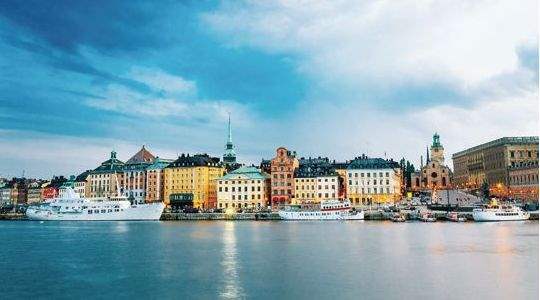 Stockholm’s finance sector is vying with tech to show the highest growth and both are booming so pressure on workspace and rents is growing. There is a trend now for banks to relocate to brand new offices in the northern suburbs, but the tech talent wants to be in the CBD. Young, high-quality human capital is difficult to accommodate as people want not only to work in the centre city but live and play there as well. Consequently, space is running out and rents are high. Most can only rent, not buy, and some have to move out to the suburbs. As in many European cities, there is a need to build more mixed-use, city neighbourhoods with good access to the centre. 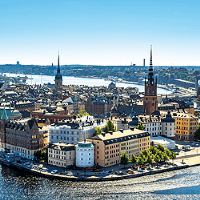 The future for occupiers in Stockholm will be in new development in regeneration projects. 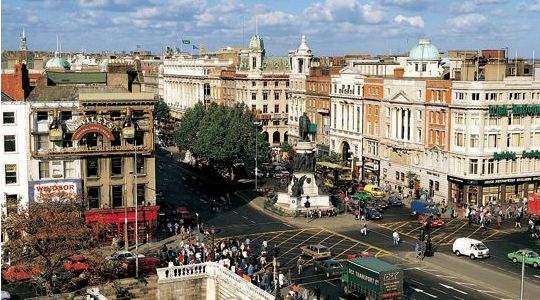 Dublin tells the same story as many popular world cities which have found favour among a variety of occupiers over the last two decades. 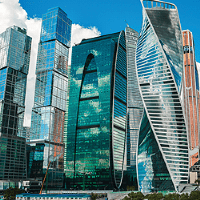 Despite the significant economic setbacks seen after 2008, the city has been successful in attracting the European headquarters of multinational and American organisations, partly through favourable tax arrangements. Locations and expansions of tech and other firms and their legal, financial and administrative service functions has fuelled demand for workspace in Dublin’s CBD in the ‘Dublin 2’ district. 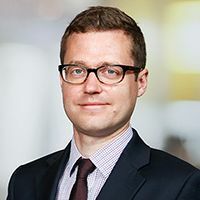 As in other cities, this office occupier demand has reduced vacancies in the traditional centre substantially so demand has spilled into neighbouring districts, but the demand is still urban rather than out-of-town campuses. In Dublin, this means that demand spilled eastwards to the Dublin 4 district and so space is becoming scarce here too, so in recent months the more affordable Dublin 3 district to the north has become popular due not so much to its urban character as its high availability and flexible terms. Those not wanting to compete in the city centre are now taking space in the southern suburbs of Dublin 18, which is mixed-use and favoured because staff can both live and work there. Residential rents are of concern for employers in Dublin as they have risen rapidly and vacancy rates are only 1.5% in the private rented sector. Once again, another city is faced with the side effect of success – increasingly inaccessible and high cost housing.